“23rd Thursday rather fine weather but muddy I did my choars was at the office all day & evening came home at 8 ½ & went to bed about 9 ½ tiard lonely & nearly sick. “24th Friday rather a cloudy disagreeable day I did my choars was at the office all day & evening came home about 8 ½ & went to bed about 9 ½ nearly sick. “25th Saturday A cold cloudy morning & a cold rainey day & evening from the North East & froze to the trees a hard storm & the river high I did my choars was at the office all day & evening came home about 8 ½ & went to bed about 9 ½ nearly sick G O Potter went to Naperville in the rain & got home a little after 5 pretty muddy & some tiard. “26th Sunday A cloudy damp muddy disagreeable day I did my choars was at the house all day after going to the office about 10 choared round till about 6. Went to office & made up the mail came home about 7 wrote some & went to bed about 9, nearly sick. “27th Monday rather fine weather for Feb I did my choars was at the office the most of the day & evening came home about 8 ½ & went to bed about 9 ½ nearly sick with a cold, lonely. “28th Tuesday rather fine weather but muddy I did my choars was at the office all day & evening came home about 8 ½ & went to bed at about 9 ½ tiard lonely & nearly sick with a cold. 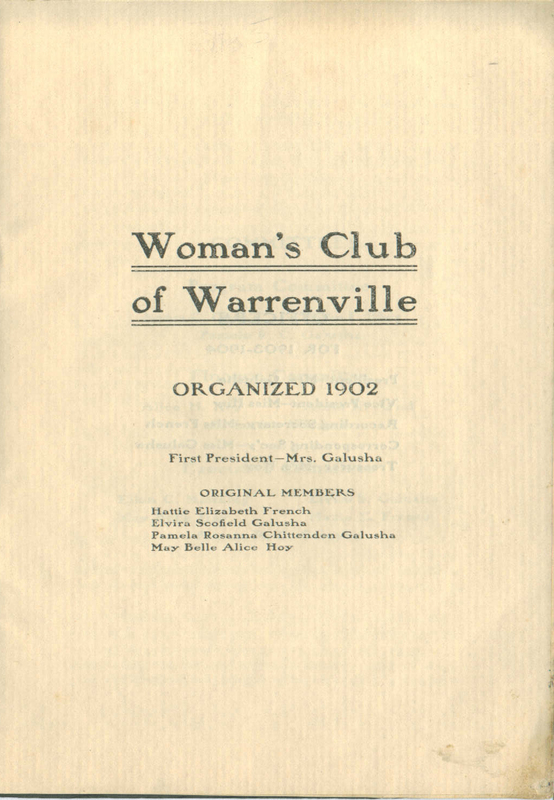 In 1902 a group of community women formed the Warrenville Woman’s Club with Mrs. Edwin Galusha as the first president. 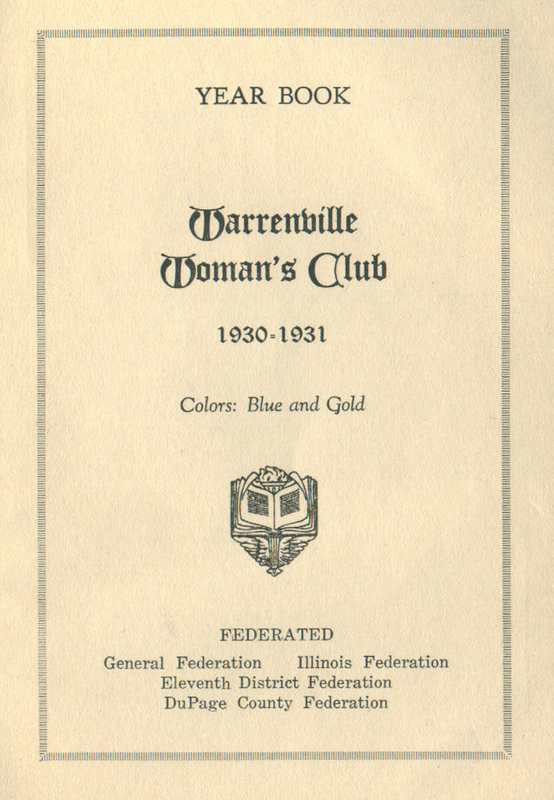 Providing help to community projects over the years, in 1927 the Woman’s Club helped establish a Warrenville public library. 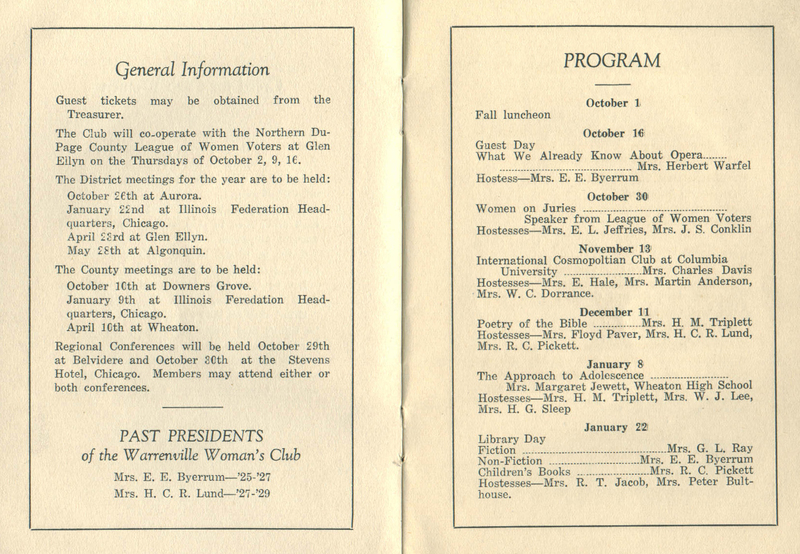 These documents are from the Warrenville Historical Society’s Collection and show some of the activities undertaken by the group in the early 1900s. “16th Thursday rather fine weather for Feb I did my choars was at the office all day & evening came home at 8 ½ & went to bed about 9 ½ nearly sick with a cold. “17th Friday rather fine with a light snow on ground I did my choars was at the office all day & evening came home at 8 ½ & went to bed at 9 ½ nearly sick with a cold George Pelham paid Phineas Graves thirty dollars as interest on a six hundred dollar note given Jesse Grave. “18th Saturday rather a fine day & muddy I did my choars was at the office all day & evening came home at 8 ½ & went to bed about 10 nearly sick with a cold [in margin] Caroline came back from her fathers Black Jerrys wife sent out & was sick. “19th Sunday A most beautiful day & evening moved fast & was muddy I did my choars was at the house the most of the day went to the office in morning & back & went to office at evening made up the mail came back about 7 & went to bed about 9 nearly sick Sol Williams & Geo Sidwell were here in the middle of the day. “20th Monday rather fine muddy I did my choars was at the office all day & in the evening came home about 8 ½ & went to bed 9 ½ nearly sick Blk Jerrys wife had a daughter [in margin] Blk Mary had a daughter. “21st Tuesday rather a fine muddy day I did my choars was at the office all day & evening came about 8 ½ & went to bed about 9 ½ nearly sick with cold. “9th Thursday rather fine cool weather I did my choars was at the office all day & evening came home about 8 ½ & went to bed 9 ½ about sick Lewey Kenyon came & stayed all night. “10th Friday A fine cool day thawed a little I dd my choars was at the office all day & evening came home about 8 ½ & went to bed 9 ½ nearly sick Mrs. L Kenyon stayed all night. “11th Saturday A fine day with a cold air I did my choars was at the office all day & evening came home about 8 ½ & went to bed about 9 ½ nearly sick with a cold, Louisa Kenyon went home with Pelham. “12th Sunday A most beautiful day with a cold air I did my choars was at home all day went to the office in evening & made up the mail came home at 7 or before & went to bed about 9 nearly sick with a cold had wrote some & choared round Mrs. Potter & Charley went to meeting [in margin] Mrs Potter & Charles went to meeting twice Caroline Wray went home to her fathers. “13th Monday rather fine weather for winter but some muddy I did my choars was at the office all day & evening came home at 8 ½ went bed at 9 ½ nearly sick with a cold. “14th Tuesday rather fine winter weather I did my choars was at the office all day & evening came home at 8 ½ & found G O Potter got home from the hospital at Memphis with his discharge & his eyes not much better he left Memphis last Saturday. It’s Fashion Friday at the Historical Society! Enjoy these Well-Dressed Women of Warrenville from local artist Mildred Baldwin’s popular column from the Warrenville Digests from February 1969. If you’d like to learn more about Mildred, see our earlier blog post here https://warrenvillehistorical.wordpress.com/2013/03/15/womens-history-month-mildred-baldwin/. 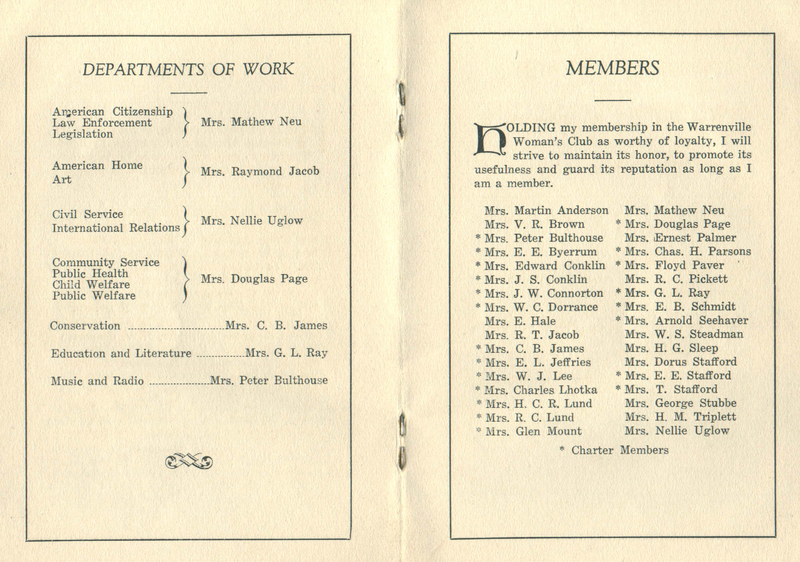 You can also stop into the museum during our open Sunday hours from 1-4pm to see the full collection of the Well-Dressed Women of Warrenville and other work by Mildred. “2nd Thursday A cloudy damp misty day & rainey night I did my choars was at the office all day & evening came home 8 ½ went to bed 9 ½ sick with a cold. “3rd Friday A damp muddy disagreeable day & froz a little at night I did my choars was at the office all day & evening came home 8 & went to bed at 9 sick with a cold. “4th Saturday A cool but some muddy day, a cold night & froze hard I did my choars was at the office all day & evening came home 8 ½ & went to bed 9 ½ sick with a cold. “5th Sunday A beautiful day & clear with a cold air, the ground was frozen hard in morning but thawed during the day, a cold night again I got up at 7 ½ did my choars was at the house the most of the day a choaring round I went to office at 10 in morning 2 & 6 in afternoon came home 6 ½ wrote some & went to bed at 9 about sick with a cold, Mrs Potter & Charles went to Baptist meeting & to Mrs Stones in evening. “6th Monday rather fine weather for winter ground bair and rough I did my choars was at the office all day & evening came home about 8 ½ went to bed about 9 ½ tiard & about sick. “7th Tuesday rather fine weather I did my choars was at the office all day & evening came home about 8 ½ and went to bed about 9 ½ tiard & sick with a cold.